Yes, we go to the New York International Auto Show (NYIAS) to sample the free food and booze, but we also go with a theme in mind. 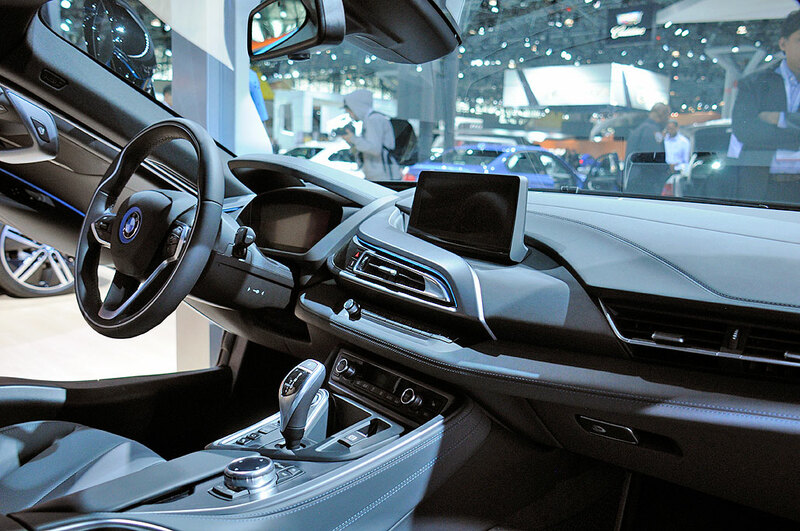 This year we were particularly interested in getting an overview of the current state of available user interfaces (UX) for in-car infotainment systems. We wanted to know because Apple will be moving into this space with CarPlay in 2015. 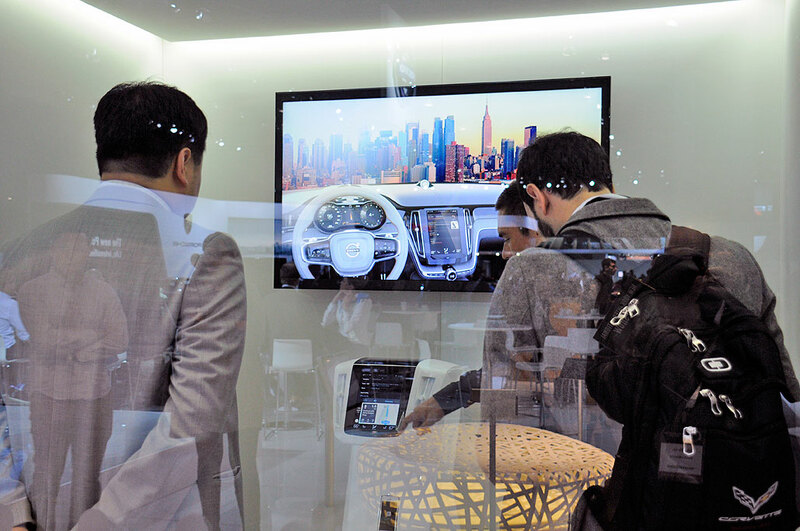 Having walked around the show, we are confident in saying that most car companies should not be be designing user interfaces for infotainment systems. There majority of implementations were cryptic, multi-leveled, and a labyrinthine mess. Most of the onscreen text was difficult to read, and many of the controls were, let us say, close to impossible to operate without looking. Don’t even get us started on the placement of the displays. Even high-end cars such as Mercedes the screen placement looks “stuck on.” Instead of a nice, elegant, integrated dash, most car interiors now resemble the cockpitof a fighter jet. The good news is that some auto makers are far ahead of others in terms of in-car UX. Companies such as Lexus and Jaguar have given serious thought on smartphone integration, app developer partnerships, and other such activities. Lexus showed us their Enform system. The user downloads the Lexus App from the Apple Apps store to their iPhone, plugs the iPhone into the USB port of the Lexus, and a suite of third-party apps appear on the Lexus screen. The system is pretty well thought out, has voice-integrated commands, and live data retrival via Internet access off the phone. The current limitation is that apps are only available from third parties who have partnered with Lexus and write apps specifically for the vehicles. We suggested they might want to consider making an SDK available to give smaller developers with great ideas a chance. This area is so new, and moving so fast, that the reps/sales people of the car companies are sometimes caught flat-footed when trying to explain their systems. Our guess is that right now it’s too difficult to bring people up to speed on the current capabilities because things are constantly in flux. We know this because many of car companies represented at NYIAS actually had engineers on the show floor doing demos 🙂 It was great for us as we had some excellent conversations with them about where they hope to take things in the near future. One such example was our chat with Mr. Peter Virk, Head of Connected Technologies & Apps of Jaguar. Yes 🙂 That is the title on his business card and clearly a position that didn’t exist a few years ago! 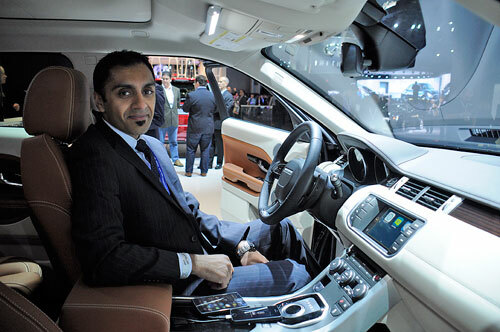 Mr. Virk gave us an excellent walk-through of the Jaguar/Land Rover infotainment system. Of all the non-CarPlay systems, we found this one to be the most seamless and the most complete in execution. The system will work with either Android or iOS phones. All of the popular music apps (iHearRadio, Pandora, etc) are available. Access to functions are possible via the touchscreen or a dial with haptic feedback. What we like about the Jaguar implementation are the Apple-like details which make everything feel more polished, like a GPS system that won’t leave you hanging when you disconnect from the car. The system will automatically switch things over to the phone and continue on from there, very helpful in a city when you end up parking a bit further from/nowhere near the actual final destination. Volvo is one of the first to announce a partnership with Apple and the only one at NYIAS showing CarPlay integration, even though it was a mock-up inside a booth and not a working prototype inside a car. Still, it was still pretty informative. What we liked about CarPlay is that it brings all those user interface elements we are already familiar with from iOS into the car. Of course, if you are not an iPhone/Mac person, there is a small learning curve involved. Still, most of the elements are quite simple to figure out. Of course, with features such as Siri, voice command is something car systems will inherit now rather than roll their own. This is good as Siri is really the only usable voice command system out there at present and even that is not saying a whole lot. Of course, current car owners will not have to buy a new car just to have CarPlay in their vehicles. They will be able to add/upgrade CarPlay-capable systems from vendors such as Pioneer and Alpine. We believe that the future of in-car UX will consist of technologies like Heads-Up Display (HUD), gesture-control, and voice-commands. 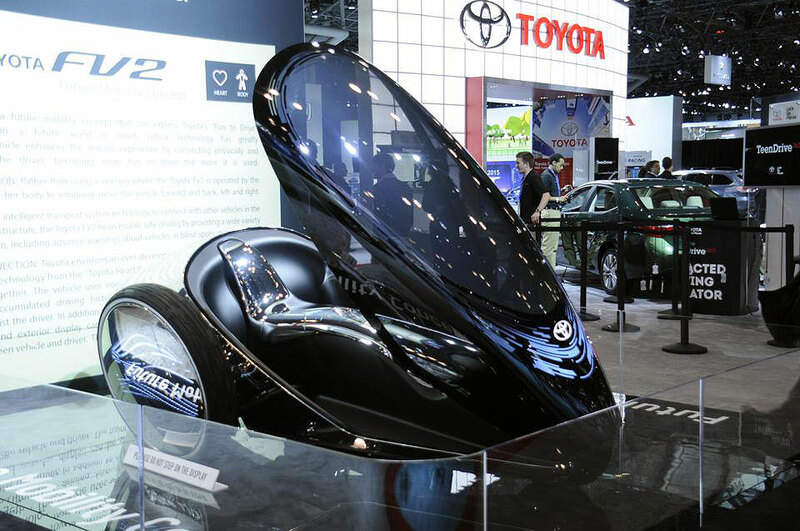 There were glimpses of those ideas in the Toyota FV2 Concept Vehicle. The windshield in the FV2 does more than protect the driver from the environment. 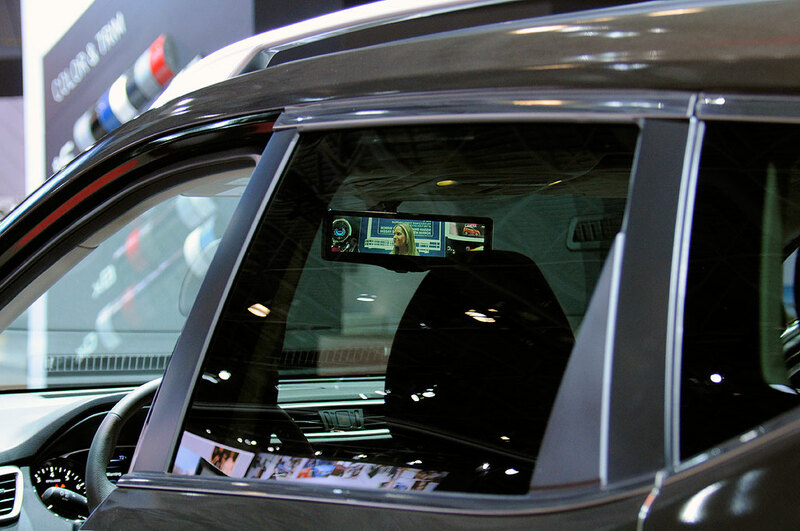 It does double duty as a see-through display screen for vehicle data, directions, and other information. We are uncertain as to what it will be like to shift one’s eyes back and forth between what’s on the windshield and what’s on the road. While “next-gen” is exciting, what “this-gen” car drivers REALLY need are technologies that will make driving safer, not more complicated/distracting. To that end, Range Rover has introduced a dim-able windshield and a “transparent bonnet.” The camera/projection system make it possible to “see through” the hood of the car, especially useful when on an uphill incline. Honda has something called “LaneWatch.” It is a camera positioned under the passenger side-view mirror which eliminates the blindspot, which on some vehicles can be large enough to “hide” a truck or a motorcycle. Nissan has a similar idea for the rear view mirror. However, instead of a separate screen, the mirror is the screen. They mounted a camera in the rear hatch so obstructions (passengers, cargo, etc) inside the car will not interfere with the view when the driver looks at the rear view mirror. Volvo upped the camera technology with something that seems to be ripped from an the TV show Person Of Interest. While the Honda and Nissan camera systems are passive, Volvo has a camera with a recognition system that will actively track objects in front and to the side of the car and will warn the driver if an object is about to come in front of the vehicle. It would not be a huge leap to think that Volvo might be able to integrate this with the braking system for intelligent object avoidance in the near future. Of course, there are a few liability implications which may have to be addressed before these systems can go live. Now that Apple has put CarPlay out there, it will be interesting to see when Microsoftand Google will respond with something more substantive than press releases and partnership announcements. There are a few battlegrounds where companies like Microsoft, Google, and Apple will go head to head. It appears the next one will be for the dash of the car. It is going to be an interesting next couple of years.